It’s just you, a few essentials, and the great outdoors. Sounds amazing, right? The minimalism of camping and hiking appeals to those who enjoy connecting with nature and who can appreciate the rush that comes with each deep breath of fresh air. While being one with nature can be pure bliss, we do, however, encourage you to remember that as superior primates, we still have certain responsibilities – like hygiene, for instance. Just because we’re in the wild, it does not mean that we need to let go and live like the wild. Oh no, for the sake of our health and for the comfort of those around us, we need to practice sanitary living even when we are “roughing” it out in the bush. It all starts with a hygiene kit. While most campers prefer to pack light, one essential addition to your backpack that simply cannot be left behind is a dopp kit full of your basic bathroom necessities. Hygiene items should include a toothbrush, toothpaste, soap, shampoo (or dry shampoo), and a loo roll. Throw in some underarm for good measure. With these toiletries at hand, you’ll be able to keep bacteria at bay and you will feel much better at the end of the day when you climb into your sleeping bag feeling good, clean, and fresh. If you are camping at or hiking to “nowhere and beyond”, then you might not always have access to clean water. To overcome this obstacle, we can suggest that you keep a small bottle of hand sanitizer in your pocket or backpacking backpack. Hand sanitizer is ideal for cleaning your hands when they are dirty or if you have just finished going to the bathroom in the woods. It’s the perfect soap replacement and instantly wipes away grime and bacteria. It’s also not limited to hand use, although it should be kept away from your eyes and other sensitive skin areas. Even the most pristine public camp showers carry foot fungal diseases and you might not want to tread where others have trod before! To curb this problem, you can simply don a pair of shower shoes or an old pair of slides or flip flops so that you keep a good divide between your bare feet and what lurks beneath. If you have some extra cash at hand and don’t mind the extra baggage, then you might also want to consider investing in one of a variety of camping showers – perfect for those who like their own space. Use your “hand” sanitizer to sterilize your feet after your shower – for some added protection. If man-made showers are scarce or far and few between, then grab a bar of soap and head into a nearby river or stream for a refreshing dunk in the water – the mere act of bathing in nature will be invigorating in itself and you’ll feel both clean and rejuvenated. As a word of caution, however, we urge you to stay away from stagnant or putrid-smelling water which could be laden with bacteria. Strong currents should also be avoided; we don’t want you to be swept away mid-cleanse. If your destination falls completely off the map and there’s no certainty that bath water will be guaranteed, then wipe! Stock up on camping wet wipes or even baby wipes will do. This way, you can still rub sweat, dirt, and grime from your body and the alcohol on the wipes will keep bacteria at bay and lower the chances of any infections. The feeling of the cool towel against your body will also feel great and should eliminate bad odors too. Just remember to dispose of your wipes properly, or opt for a biodegradable brand. You don’t have to be a neat freak for this to make sense. When outdoors, you tend to build up a larger sweat. This sweat seeps into your clothes and soils them in the process. To avoid wearing dirty garments that carry germs, you can make sure you pack many fresh outfits, or you can wash your clothing regularly in a nearby stream using a biodegradable washing soap. Hang your clothes out to dry or air as often as you can and avoid packing them away if they are even the slightest bit moist. If you simply have to pack light and have no intention of doing laundry while you venture into the wild, then we do recommend that your camping outfits are made from synthetic fabrics, at the very least. Synthetic clothes are made from moisture wicking materials. This means that the fabric limits bacteria and wicks away sweat so that you don’t feel clammy and your gear is left cleaner than it would have been otherwise. While natural fibers might seem more applicable to, well, nature; synthetic apparel is what will help to keep your hygiene levels in good order. We touched on clothes-washing in point 6 but we would like to highlight that a crucial part of keeping your personal hygiene intact is to make sure your clothes are also clean and free from nasty bacteria. You can wash your clothes in a bucket or a stream, or you could apply the refuse bag hack where you place your clothes into a clean bin bag, pour in some water and soap and then jostle the bag around (followed by a rinse). If you’re serious about your camping, then portable washing machines are also a thing! And once your garments have been washed, you need to make sure that you dry them thoroughly. If you pack clothes into a bag while they are still damp, then they could gather mold and mildew, which is a health hazard in itself. Bugs – I am sure that we can all agree that we’d like to give them a miss. Not only do they buzz and creep and crawl their way onto our bodies and belongings, but they are also carriers of an assortment of germs and diseases. The irony is that the more unhygienic you are, the more critters you attract. So, if you do pick up dirt and a nasty sweat in between cleansing, then we suggest you use an effective insect repellent to keep bugs at bay. A good idea is to purchase a 2-in-1 moisturizing repellent. This way you can soothe your skin at the same time. We do, however, recommend that you preferably stick to a bug spray/cream that is odorless or is only subtly scented. Some fragrances can attract wild animals, which we definitely don’t want! Heated conditions and over-exertion of one’s body calls for frequent hydration. When we hike or camp then water becomes an extremely valuable resource that could be scarce. This means that water is often limited to drinking only and hygiene might draw the short end of the straw. You could, of course, lug buckets and bottles of your own water around, if possible. Alternatively, you can also invest in a nifty portable water filter which is a more realistic solution for serious hikers and campers. Whatever you do, do not resort to using unsanitary stagnant or dirty water to cleanse yourself or your belongings with – this can do more harm than good. Hey, when you’ve got to go you’ve got to go! Not all campsites have toilet facilities, some don’t even have a rickety outhouse. So, when nature calls then it’s going to get what it’s asking for. Pooping in the woods isn’t the most dignified act but it’s not the worst scenario either. If you don’t have a portable camping toilet, with a loo roll on hand (or a few leaves) and a shovel at your disposal, you can dig yourself your own DIY potty for just a touch of outdoor class. Once done, we urge you to cover up your donation. You don’t want to attract bugs, bacteria and wild animals with waste – gross. A part of keeping your person clean is making sure your surroundings also meet good hygiene standards. This is where refuse bags come in super handy. Not only can you use them to collect and store trash, but they also make protective ground covers, an impromptu pair of gloves, a makeshift raincoat, and like we mentioned above, a DIY washing machine. Plastic bags are lightweight and can be folded to be very compact in size – they are the perfect cleaning tools and are great for an assortment of hygiene hacks, or hacks for camping and hiking in general. When we venture outdoors, our feet do most of the work. This means that once those hiking socks come off, your nose might be in for a kick. Your feet sweat when you walk and if you wear a pair of hiking shoes that fail to breathe properly, then that sweat will pool in your soles, causing an environment that bacteria can thrive in. Air your feet and your sneakers out often, wash your socks and use those convenient camping wipes to remove sweat and dirt before putting your kicks back on again. Nobody likes smelly feet, full stop. Your mess kit, camping gadgets and accessories, and all your outdoor essentials need to be kept sanitary – both for health and hygiene purposes. Soiled utensils can rot and attract an assortment of critters, big and small. Wash and rinse your plates and cutlery after each meal, sanitize your portable shovel after each bathroom visit, and even go as far as giving your backpack a good rinse and airing if you are out trekking for more than a couple of days. Dirty equipment can make you ill, it can make you smell and it can make you become a beacon for flies to buzz and hum around. Rinse your belongings in rivers and streams if you must, and then spray them with a sterile solution for good measure. 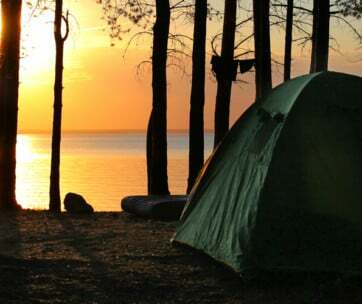 Visit your local camping outlet for a sterilizing spray that’s safe to use on all items. Keeping our bodies and personal belongings clean is one thing, a great thing, in fact. But we also have a responsibility to keep our surroundings in their natural state – unmarked and unsullied. Using biodegradable products to wash yourself and your possessions is a good start. These solutions tend to be free from harmful chemicals and won’t taint or damage the water and ground they come into contact with. Earth-friendly products are also usually gentler on the skin, soothing you as you practice good hygiene – even when camping! Long days spent hiking under the hot sun and starry evenings spent around crackling campfires can leave you smelling less than rosy. 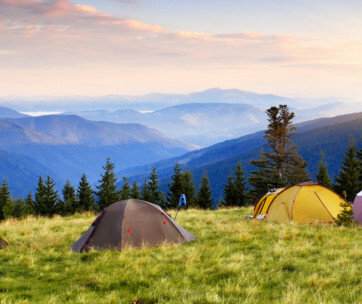 To avoid crawling into your sleeping bag with dirty feet or to protect your fellow campers from your own foul odors, we highly recommend that you consider our camping hygiene tips and suggestions, or more importantly so, put them into good practice.